Since the lovely Stacey made suspenders in May, she came back around in August to the sewalong for the Let’s Go Fishing Hat. – This pattern is the perfect thing to use up scraps of fabric or even old T-shirts that you have lying around. – You will need approx. 1/2 yard of fabric and 1/2 yard of interfacing to make this hat, which is one size fits all. What an adorable pattern for an adorable kid! Stacey commented in her post that it only took her about an hour to stitch up this hat, so it’s a perfect quick-stitch for a weekend at the beach or a day in the summer sun. Do you want to know a secret? 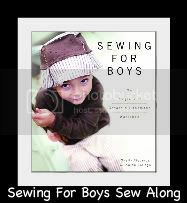 Even though the book is called Sewing for Boys, this particular pattern would be equally adorable for the little ladies in your life, too! Thanks for joining us for another sew-along! If you’d like to show off your Let’s Go Fishing hats or any other patterns from the book, pop on over to the Sewing for Boys Flickr pool and show your stuff!